Kävele Main Street! Tämä poikkeuksellinen vuorenrinteellä koti sijaitsee kaupungin Park City historiallisen Vanhan kaupungin alueella ja on upeat näkymät Park City laaksoon ja kohti Deer Valley, joka vie sanattomaksi. Nauti luksusmajoitusta tässä 3100 sq. Ft. Kotiin holvikatot, kaunis sisustus, ja monet extrat. Kiinteistö on varustettu gourmet-keittiö, ruokapöytä 10, kotiteatteri, lattialämmitys kylpyhuoneessa, satelliitti-tv, ja nopea langaton internetyhteys. Ei lemmikkejä: Ei lemmikkejä ole sallittuja talon tai sen ympärillä milloin tahansa. Tupakointi kielletty: Tupakointi ei ole sallittua talossa tai sen ympärillä milloin tahansa. Asuinpaikka ja ajoneuvorajoitus: Enintään 11 henkilöä saa olla talossa milloin tahansa. Autotalliin tai ajotieltä ei saa missään vaiheessa sallia enempää kuin 1 ajoneuvo per 5 vierasta. Kadun pysäköinti ei ole sallittua. Ei osapuolia / ei tapahtumia / ei suuria kokouksia: ehdottomasti ei talon juhlia, ei tapahtumia tai suuria kokoontumisia. Jos talon osapuoli yrittää miehittää omaisuutta, ryhmä ja vuokralainen häätetään ja kaikki rahat menetetään. Ääniä musiikkia ei suvaita, ja kaikki musiikki on suljettava pois klo 10 mennessä. Liukkaat ja jäisät olosuhteet ovat olemassa: ajotieltä kyntetään ja merkintä on lapioitu sen jälkeen, kun se lunta, mutta vielä on liukkaita ja jäisiä olosuhteita, kuten katon lumi ja jääpuikot. Ei laitteita talossa: Pidä kaikki sukset, lumilauta, pylväät, polkupyörät ja varusteet autotallissa. Sovellettava laki: Asiakas sitoutuu noudattamaan hallintoalueiden lakeja, sääntöjä ja määräyksiä. Master kylpyhuone, jossa WC, puhallusputkella Tub ja Steam suihku. Vieras kylpyhuone amme / suihku combo ja WC. Muu vieras kylpyhuone ja WC. Jauhe suihkuhuone. The property is excellent. Bo was very responsive and helpful. We will return soon! Great home, with access to skiing and downtown. The home was clean, and had everything we needed. We hope to return soon! Thank you Bo! Luxury Park City Rentals could not have done a better job! They had a warm welcome basket. They had several suggestions for dining, transportation, activities and concierge services to make our stay with kids easy and fun! The details of the house exceeded all of our expectations. We will book our accommodations through Luxury Park City Rentals again! Thank you, Bo! Awesome house with everything, all amenities. Very comfortable and modern with a posh cabin feel. Fantastic room to store ski gear complete with built in boot/glove dryers which was superb. Easy walk down to Main Street via a steep staircase from Ontario avenue. Obviously a more strenuous walk up the stairs when heading home. Tried walking to Town Lift for skiing, really difficult in ski boots. If you can convince a friend to drive and park in the Town Lift ramp or drop you off its much much easier. Also can take Uber-Ski, but the hill to get up is super steep and a few drivers refused to take us up when snowy. Management (Bo) was great to work with, very accommodating and professional. We thoroughly enjoyed our stay! The house was amazing and exactly what we needed for our Park City stay. Highly recommend and hoping to stay here again! This property is fantastic and better in person than even the pictures can show! Perched up high, it has great views of the Main St area and ski resorts. The unit has 4 levels. You can enter from the one car garage into level one. There is a bunk room with 4 beds and a nice full bath. Down the hall are cubbies with boot dryers and a perfect spot to leave jackets, gloves helmets etc. Rack in garage for skis. Walk up a level to the beautiful and super homey and comfortable kitchen, dining and living rooms. High end appliances in kitchen and appointed with everything you need. Everything was clean and in great shape. Furniture is really nice and also in great shape. Does not look or feel like a rental property at all. Great views through the giant windows. Up to the next level are two more bedrooms with big comfy beds. They share a very nice double vanity full bath and a spacious living room area with big screen TV. Up to the 4th level is the spectacular master suite with more great views, huge master bath with big tub and delightful and working steam shower. Large walk in closet is perfect. The master bed was super comfortable and there is a nice gas fireplace. One of our families favorite features though is the deck with hot tub right off the master. The best views in the entire place! The location of the property is on a very steep and narrow road, so a bit precarious. My wife and I walked to Main St twice, once to High West Distillery and it took about 12 minutes. We took an Uber back rather than walk up the very steep street. Another night we walked down Shortys Stairs right to Main St to dinner at Chimayo. (Cut through parking lot, it’s much faster, don’t follow google maps!) That took about 8 minutes. We walked home and that gets the heart pumping. Not for the physically unfit but very manageable. Bo the owner and manager was super quick with all responses. We arranged discounted lift ticket vouchers for Deer Valley through him, and we rented equipment from Ski n See and got a 25% discount. 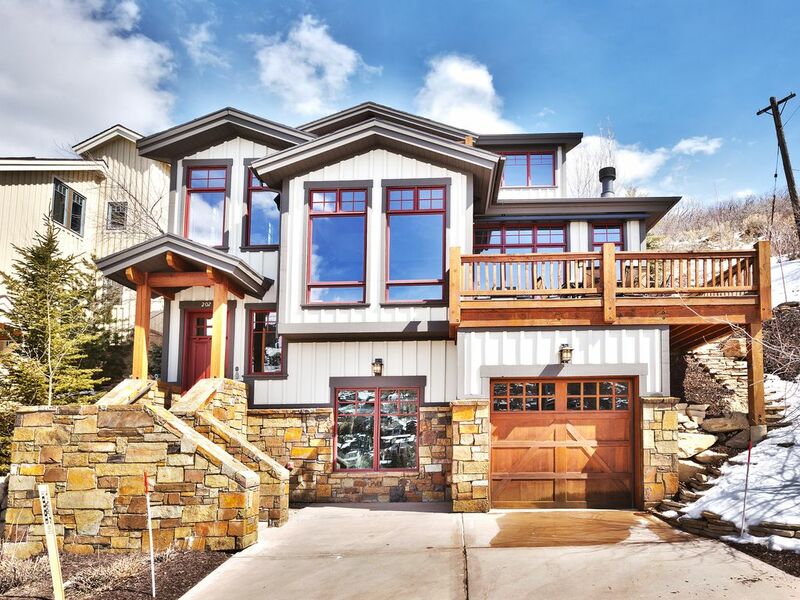 Easy 5 to 10 min drive to either Park City Mountain or Deer Valley Resort. We would rent again with Bo and Luxury Park City Rentals in a heartbeat! Highly recommend!